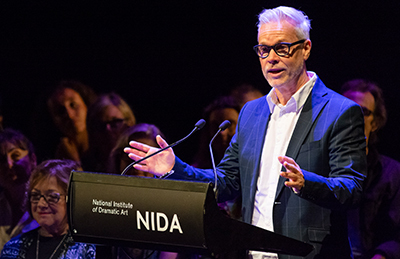 Tim Jones addresses NIDA students (Photo: Patrick Boland). Firstly, congratulations. To those of you who are completely new to NIDA - you made it! To those of you returning, you’ve survived! Excellent all round! Seriously, I think it’s worth acknowledging that all of you here achieved something significant to be here. And I know – because I did it too – and it wasn’t easy. I auditioned three times to get into this place, because deep within me a little voice said, I want to learn about acting and NIDA is where I need to go to do that. Whatever your discipline and course that you are about to start or continue, I strongly suspect you have all sweated to get here because all of you have had that little voice that has said, I want to go and immerse myself in the performing arts all day every day and NIDA is where I want to do that. So, again, congratulations. I feel enormously privileged to be asked to be here because today is an important day. Some of you might be thinking that this is just the boring admin day before classes start and things get interesting, but make no mistake – today is special. For new students this ceremony marks the beginning of a new chapter in your lives. Important. For returning students it’s a moment to reflect on your first year or two and think about how you will approach the year ahead. Also important. Like all big days, I expect you are filled, as you should be, with excitement, anticipation, a requisite amount of fear and, I strongly hope, large doses of optimism. I felt all this when, 30 years ago, I was in your shoes about to study for my degree in acting- Not far from here, up the road on High St in what affectionately became called old NIDA ahead of coming here to this amazing facility in my final year. When Jennifer asked me to speak today, I thought of my first day, which I remember clearly, but we didn’t really have a major event like this to start things off. So, with the benefit of hindsight, I decided that I should say to you what I wish was said to me then – I should aim to say important words to match the importance of the day that hopefully provides an inspirational guiding compass for your time at NIDA, for a life in the arts - plus I should throw in some sage advice for when things get tough. So, no pressure - but after quite a bit of reflection, it’s this. I’m going to start with a bit of personal history – so bear with me, I think it’s relevant. As I said, in my third year we moved from old NIDA to this fantastic building and even better my year group was selected to create the first official production to open the new theatre - which is now the Playhouse next door. As a year we had not had much connection with Genet so as part of the rehearsal Jim split us into groups to perform sections of his other plays - to each other - a show and tell of sorts to get to know more about Genet. He asked us who would like to direct and for some reason I thought that I’d like to have ago at that, and stuck up my hand. After our presentation of an equally rare Genet play, The Blacks, Jim pulled me aside and said, Tim that was quite good - you might like to consider being a director. Now, I was enrolled in the acting course, so that was a little hard to hear - I wasn’t fully sure what he was saying so I stored that compliment away (even though I thought he may have been gently suggesting an end to my acting aspirations) and marched on with my life. For close to ten years I acted largely in theatre but also in film and TV. I worked with some of the people now on staff here at companies like the Sydney Theatre Company and also back at here at NIDA. I travelled, seeing and participating in theatre around the world and I taught acting quite extensively, which was always an interest, both here and at the Australian Theatre for Young People. I had a great ten years, but a time came when I wanted to grow, to gain more skills, explore new areas. At that exact time, ATYP advertised a full-time job creating programs for young people to engage in the professional performing arts. The little voice spoke again, and I enthusiastically applied and was offered the role. Barely two months later the then Artistic Director resigned and someone was needed to direct the first show of the year. It was then that I remembered what Jim had said and so I, again, stuck up my hand (and maybe talked up my experience a little more than the reality) and directed a contemporary take on Antigone for atyp. This led to directing 14 more productions for the Company in small studio venues through to the Sydney Opera House. During this time I became the Artistic Director of the company, toured overseas to a major festival, premiered new work in the Sydney Festival in partnership with the Young Company of the National Theatre of Great Britain, worked with outstanding established writers, and developed the skills of emerging new writers who now are regularly programmed by the main-stages. I instigated grass-roots programs with aboriginal youth in remote Australia and developed collaborative performance projects with companies and artists ranging from Meryl Tankard, to Cirque du Soleil – that one with Gavin Robins who is on staff here. This work led to my current role as Artistic Director of the Seymour Centre, where I have continued developing and directing new Australian work but have also moved to the challenge of running an arts venue, programming outstanding national and international performances to be presented in the venue and partnering with events such as Sydney Festival to present major companies like the RSC in our theatres – and making sure artists such as Seal, Michael Buble and Florence and the Machine can perform successfully in our venue. In essence, I am now able to have a creative idea and, if everything lines up, make it a reality – and I feel so fortunate and content to now be in this position. My point is this: 30 years ago, when I was in your shoes, never would I have thought that my career would have played out as it has done. Yet it’s precisely because of the training I received here, that I was able to take those steps in-between, to listen to the little voice that got me here in the first place and be where I am now. It’s precisely because NIDA put Jim Sharman in my path that he provoked me into thinking about my creativity in new ways that has led me to where I am now. So my message to you is this: the training you will receive here is golden. The teachers, mentors, artists you will connect with will be extraordinary, so love every moment of what you are about to do, extract the knowledge and experiences you are provided for all they are worth, like a leech sucking blood (I’m not sure about the metaphor but you get what I’m saying) because you never know where in the arts and in life that knowledge might lead you. Of course there is a deal in this and this leads to the second main point I wanted to say to you today: During your time at NIDA, no matter what the duration of your course, you need to put in more than you get given – much more. It’s one thing for NIDA to provide great opportunities for learning, but you need to ‘stick up your hand”, you need to push yourself forward, you need to stay here until midnight and rehearse, plan, draw, build, sing, create if that’s what the little voice inside you says you must do to make the most of the opportunities you are being given. If staff keep talking about a great film or play that you don’t know, read it or see it. Be curious, work hard and your journey here and beyond will be infinitely rewarding. Lastly, when it gets tough, when your life seems to exclusively be lived on Anzac Parade Kensington, remember the big picture. Remember that you are here to learn about the making, the shaping, the presentation, the performing of art. You are here because you have an interest in participating in an art form that, at its best, touches the heart, reflecting the dilemmas and joys of the human condition, one that can imagine and then present visions of a better future for us all. You have the opportunity to learn how to advance our culture through the performing arts, to say something you feel needs to be said at this moment in time for the benefit of all: to provoke, to inspire, to connect. Because the great thing about the performing arts is that it’s about the world as much is it’s about you – it has to be - because we don’t really have a role without an audience, without someone to communicate to. That’s the game we are in, that’s the bigger picture, that’s the job of the artist, the arts worker, the cultural leader: Connecting to others, through the performing arts. I’m also very thankful to be here, because it gives me an opportunity to thank this place for what it’s given me. I can only hope that each and every one of you make the most of being here and that you can, at some stage in the future, come back, like me and do the same. Andrew is passionate about gender equality, social justice and making art accessible to all. His work defies boundaries and includes research, performance, evaluation, writing, theatre making, and public health. 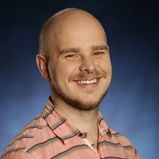 Andrew completed a PhD in 2017, which examined issues of gender in Australian contemporary dance.